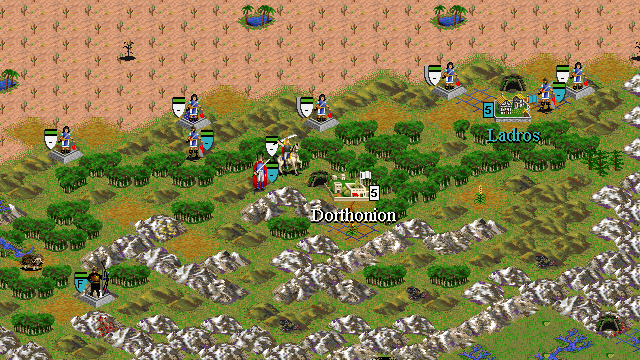 A scenario for Civilization II: Conflicts in Civilization by Hurin. Four hundred and fifty-five years have passed since Fingolfin led the greater host of the Noldor across the grinding ice ere the rising of the moon. In that time, due to Fingon's heroic rescue of Maedhros, the two feuding Houses of the Line of Finwe have reconciled and stand allied against the threat in the North. For, though only Feanor and his sons took the Oath to pursue anyone who should hold or keep a Silmaril, Fingolfin, prior to their rash words, hastily swore his own oath as a gesture of goodwill that he would follow Feanor wherever he should lead. Thus, he and his House were ensnared in the Doom of Mandos and the power of Feanor's Oath. Upon their return to Middle-earth, the Noldor managed to encircle Morgoth in his Northern stronghold of Angband. Now, the Dagor Bragollach is at hand. Flames have issued from the pits of Angband, consuming many valiant warriors on the plains of Ard-Galen and leaving the once rich land a charred wasteland. Following these Hell-wrought flames are the vast armies of Morgoth, vast beyond the imaginings of the Eldar. Great deeds of story and song lie ahead. Will the Eldar, Edain, and Naugrim be able to endure this onslaught and preserve hope for a victory in the future? If the Free Peoples of Beleriand can endure and maintain a semblence of strength until the Union of Maedhros is formed in 473, hope may yet remain. Great and terrible days are to follow. The Battle of Sudden Flame and the utter ruin of Beleriand draws nigh. . .